The Static Secrets guide introduced the basics of working with key-value secret engine. Vault 0.10 introduced K/V Secrets Engine v2 with Secret Versioning. 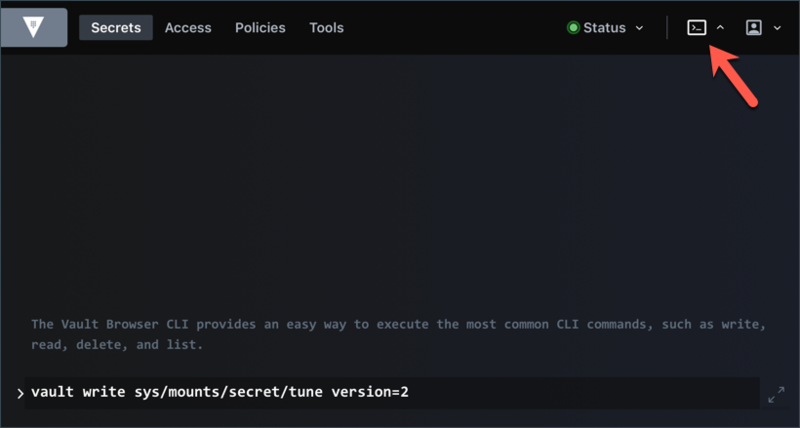 This guide highlights the key-value secret engine v2 features. The KV secret engine v1 does not provide a way to version or roll back secrets. This made it difficult to recover from unintentional data loss or overwrite when more than one user is writing at the same path. Run the version 2 of KV secret engine which can retain a configurable number of secret versions. This enables older versions' data to be retrievable in case of unwanted deletion or updates of the data. In addition, its Check-and-Set operations can be used to protect the data from being overwritten unintentionally. This guide demonstrates the basic commands for working with KV secret engine v2. Before beginning, verify that you are using the v2 of the KV secret engine. Where <TOKEN> is your valid token, and <VAULT_ADDRESS> is where your vault server is running. The indicated version should be 2. If the version is 1, upgrade it to v2. Alternatively, you can enable KV secret engine v2 at another path by clicking Enable new engine. Select KV from the list, and then click Next. Under the Version, be sure to select 2. To understand how the versioning works, let's write some test data. 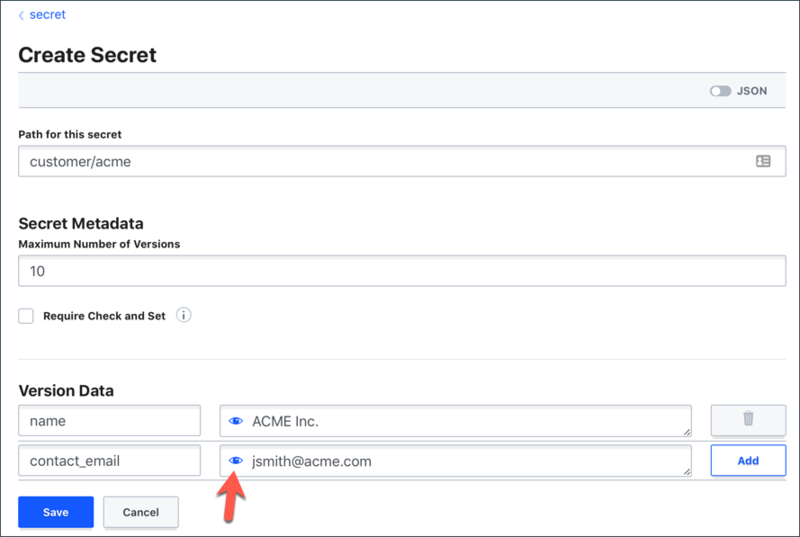 $ vault kv put secret/customer/acme name="ACME Inc." contact_email="jsmith@acme.com"
$ vault kv put secret/customer/acme name="ACME Inc." contact_email="john.smith@acme.com"
Now you have two versions of the secret/customer/acme data. Run vault kv get to read the data. vault kv put secret/customer/acme contact_email="admin@acme.com"
$ vault kv patch secret/customer/acme contact_email="admin@acme.com"
Notice that the endpoint for KV v2 is /secret/data/<path>; therefore to write secrets at secret/customer/acme, the API endpoint becomes /secret/data/customer/acme. Now you have two versions of the secret/customer/acme data. Read back the secret. 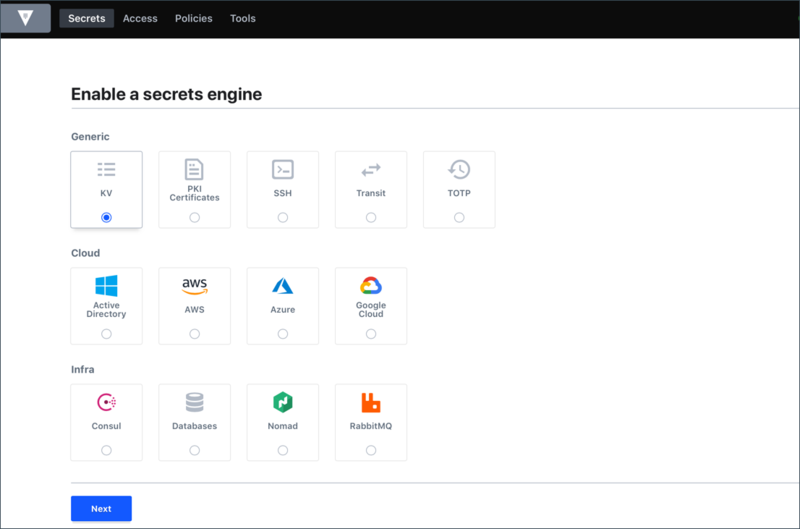 In the Web UI, select secret/ and then click Create secret. Enter the secrets. You can click on the sensitive information toggle to show or hide the entered secret values. 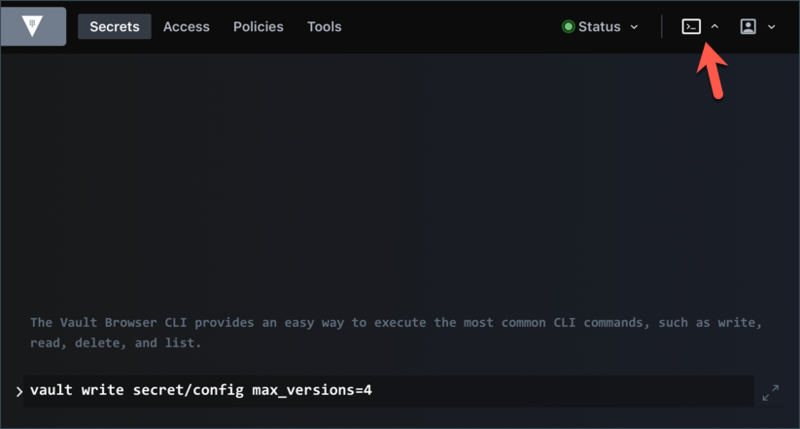 NOTE: Notice that the Maximum Number of Versions is set to 10 by default. 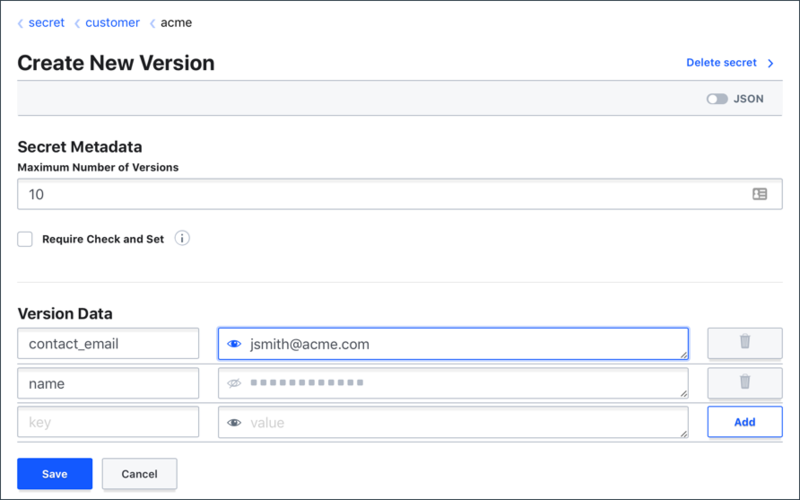 To update the existing secret, select Create new version, change the contact_email value, and then click Save. You may run into a situation where you need to view the secret before an update. The version changes from Version 2 to Version 1. To view the raw values, click on the sensitive information toggle. You can create a new version of the secrets based on an older version. This can help revert an older version of the secrets. By default, the kv-v2 secret engine keeps up to 10 versions. Let's limit the maximum number of versions to keep to be 4. Overwrite the data a few more times to see what happens to its metadata. In this example, the current version is 6. Notice that version 1 and 2 do not show up in the metadata. Because the kv secret engine is configured to keep only 4 versions, the oldest two versions are permanently deleted and you won't be able to read them. Invoke the secret/metadata/customer/acme endpoint instead. Overwrite the data a few more times to see what happens to the data. Overwrite the data a few more times to see what happens to its versions. The metadata on versions 4 and 5 reports its deletion timestamp (deletion_time); however, the destroyed parameter is set to false. Let's delete versions 4 and 5. At the secret/customer/acme path, select History > View version history. Expand the menu for Version 5 and select Delete version. At the confirmation dialog, click Delete to proceed. Repeat the steps for Version 4. Now, Version 4 and 5 should be marked as deleted. 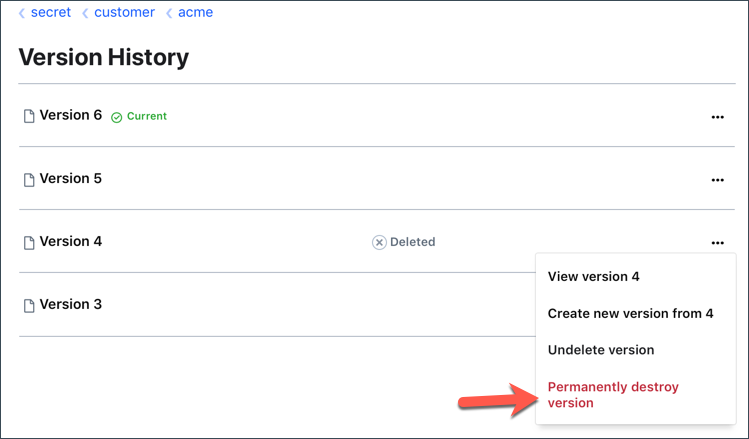 If version 5 was deleted by mistake and you wish to recover, select Undelete version from its menu. The metadata indicates that Version 4 is destroyed. To permanently delete a version of secret, simply select Permanently destroy version from its menu. The v2 of KV secret engine supports a Check-And-Set operation to prevent unintentional secret overwrite. When you pass the cas flag to Vault, it first checks if the key already exists. By default, Check-And-Set operation is not enabled on the KV secret engine; therefore write is always allowed (no checking is performed). Once check-and-set is enabled, every write operation requires cas value to be passed. If you are sure that you want to overwrite the existing key-value, set cas to match the current version. Set cas to 0 if you want to write the secret only if the key does not exists. $ vault kv put -cas=0 secret/partner name="Example Co." partner_id="123456789"
$ vault kv put -cas=1 secret/partner name="Example Co." partner_id="ABCDEFGHIJKLMN"
If the cas value is missing in your write request, the "check-and-set parameter required for this call" error will be returned. If the cas does not match the current version number, you will receive the "check-and-set parameter did not match the current version" message. 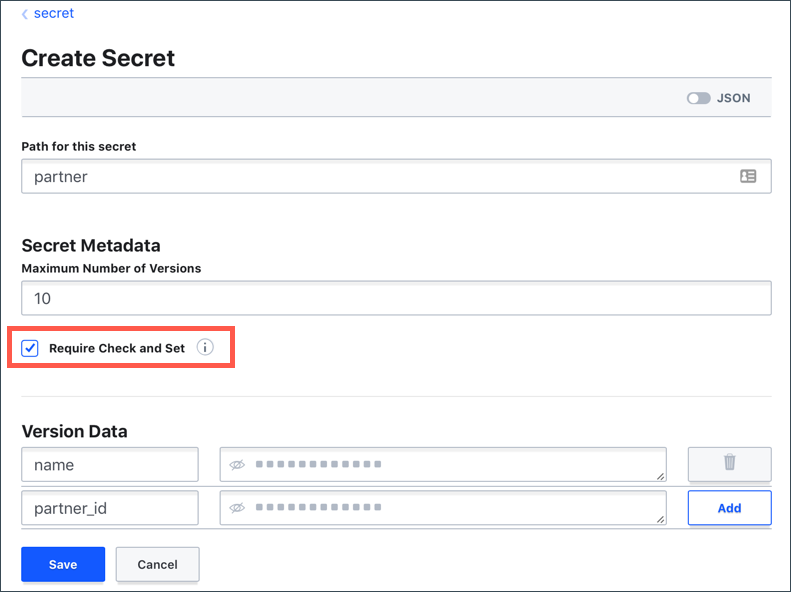 To enable the Check-And-Set operation, select the Require Check and Set check-box when you create secrets. NOTE: UI will always write a new version with cas even if the check-and-set operation is not required.